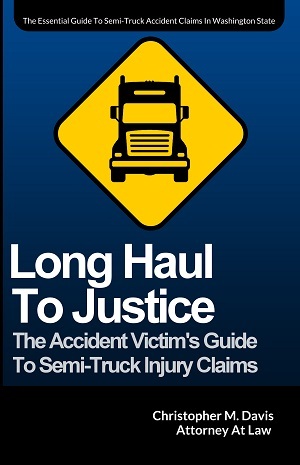 Serious and/or fatal crashes involving semi trucks are often related to illegal/unofficial parking on on-ramps and off-ramps, shoulders, and freeway lanes that create hazards for motorists. Exit ramp parking is a huge problem in Washington State, particularly on Interstate 90 exits near North Bend, WA. There have been several numerous semi-truck accidents on exit ramps in the area. Davis Law Group represents victims of several of these crashes, including a parked semi truck crash that occurred on the off-ramp of Exit 34 on I-90. A 2018 Pacific Northwest Transportation Consortium (PACTRANS) report entitled, Safe Truck Parking in PacTrans Interstate Corridors: I-5 and I-90, states that an inadequate supply of parking spaces for long-haul drivers creates safety issues often leads to severe or fatal crashes, as tired drivers face the decision of choosing between parking at unsafe locations or continuing to drive. According to a 2016 WSDOT Truck Parking Study, entrance and exit ramps are the third most commonly used sites for semi-truck parking in Washington State. The WSDOT study noted that truck drivers frequently park vacant areas alongside the highways including roadsides, shoulders, highway exit and entrance ramps, mountain pass chain-up areas, passing zones and pullouts, land adjacent to highway corridors, under elevated roads/bridges, and in the median of divided highways. The WSDOT Trucking Parking Study states that regional WSDOT maintenance staff around the state have observed that many rest areas on Interstate 5, Interstate 90 and Interstate 82 are regularly over capacity with trucks parked overnight. As a result, many truck drivers park in unofficial locations on the shoulders of the entrance and exit ramps of rest areas. The PACTRANS research team conducted in-person surveys with drivers at truck stops in Washington State, including TA Seattle East Travel Center in North Bend — which is accessed via Exit 34 from I-90 westbound. They found that when the truck plazas were full, 43% of all the drivers interviewed said that they have parked on a highway ramp and/or shoulder. However, 52% of TA Seattle East truck drivers surveyed said that they have parked on an exit ramp or shoulder. A Facebook post below shows a frustrated trucker who was asked by Washington State Patrol to remove his illegally parked semi truck from Exit 34 back in January of 2016. The Google Maps street view photos below were taken in July 2018. The photos show dozens of trucks parked on exit 34 off of eastbound Interstate 90 during the middle of the day. There is a visible 'No Parking' sign on the right of the exit ramp just after it separates from I-90. Apparently WSP was not pushing for strict adherence to the law that summer. Why Do Truckers Park On Exit Ramps? According to the 2016 WSDOT Truck Parking Survey, which drew data from over 1,000 truckers operating in Washington State, the most difficult corridors to find legal parking options are I-5, I-405, and I-90. The WSDOT study also noted that, "the majority of truck drivers and companies were unwilling to pay for parking..." which causes truckers to use unofficial parking locations such as exit and entrance ramps, chain p/down areas on mountain passes and on roadway shoulders which all pose a safety hazard to the public. The majority (75 percent) of respondents said company owners do not provide any support (guidance or financial support) for overnight parking.